It's super cool! 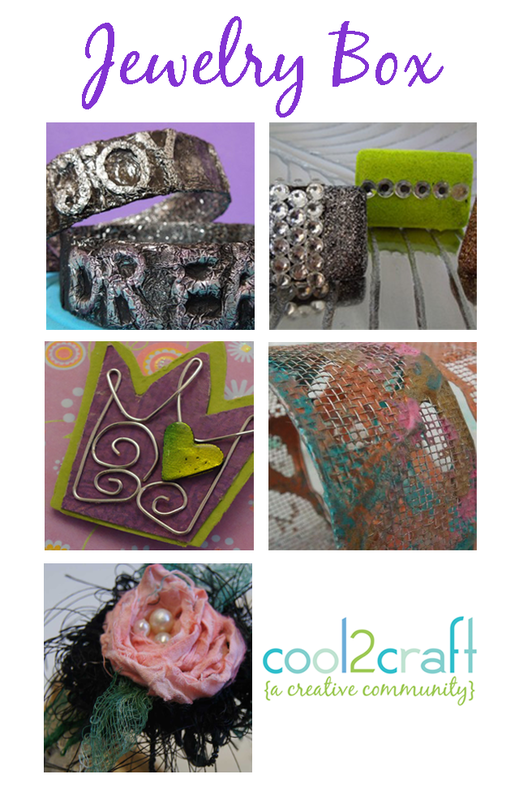 Cool2Craft TV April 16, 2012: Jewelry Box! - We're celebrating creativity with jewelry-themed ideas this week! EcoHeidi Borchers is creating a fan favorite Window Screen Bracelet using Aleene's Tacky Glue for a cool texturing technique, Candace Jedrowicz is making a Mixed Media Crown Brooch with Aleene's Turbo Tacky Glue, Tiffany Windsor is sharing the vintage Aleene's technique of the look of metal with aluminum foil to create Water Bottle Embossed Foil bracelets with Aleene's Super Thick Tacky Glue, Savannah Starr is making SavvySparkle Bling Rings and Linda Peterson is crafting a Vintage Inspired Flower Headband. It’s easy to watch the Cool2Craft TV Channel right from your computer. Airing Monday April 16, 2012 9am Pacific/10am Mountain/ 11 am Central/ Noon Eastern. Go to http://cool2craft.com and you'll see the Livestream player and chat box. See you Monday!